Water workouts are an effective low-impact option for fitness. Looking for a new workout routine? Grab your swimsuit and head to the pool. Water-based workouts can be enjoyed year-round. Water has several properties that make it an exercise medium of choice. The buoyancy of water eliminates the effects of gravity. In shoulder-deep water, your body weighs 90 percent less than on land. Water workouts are low impact, which protects joints and muscles from compressive forces and injury. The viscosity of water creates a natural resistance to movement, making your workout more effective. According to the Mayo Clinic, water workouts burn more calories than cycling, hiking and low-impact aerobics. In fact, a 160-pound woman will burn more than 400 calories in one hour of water aerobics. Jogging on land is a high-impact and high-stress activity for your joints and muscles. Performing jogging in deep water significantly reduces the stress on your body while creating an effective strength and cardiovascular workout. 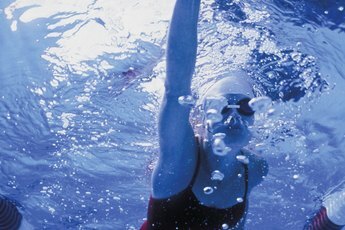 Deep-water jogging is considered a high-intensity cardiovascular workout and is effective for cross-training, injury recovery and to vary your fitness routine. Deep-water jogging is easy to perform. Get in the deep end of the pool to chin level and mimic running. Remember, you aren’t trying to swim, so keep your body straight up and down in the pool. To get a more effective workout, lift your knees waist high, higher than you would for comparable running on land. Point your toes down to allow your legs to cut through the water more easily. Exaggerate your arm swings, pumping your arms forward and back with your elbows bent to 90 degrees. You can also perform interval training and negotiate hurdles by jumping. A floatation vest or belt is typically used to keep you afloat. It will also help you maintain good positioning and keep you from floating too much on either your belly or your back. Ankle weights can be added to your legs to further increase the resistance. Another mechanism of increasing resistance is to tether your flotation device to the side of the pool. This creates a mechanism where you are literally trying to run away from the pool wall; this may also help you maintain good form. Your heart rate is an average of 17 beats lower in water compared to a land workout; decrease your target heart rate by the same 17 beats for a water program. Remember to stay hydrated. Your body is often working harder than you give it credit for, so keep a water bottle poolside. Hydrate as much, if not more, than you would for comparable exercise on land. Don’t forget to do a two- to three-minute warm-up and cool-down.